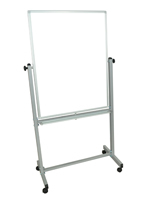 Need a teaching tool or presentation aid that moves between classrooms or offices with ease? 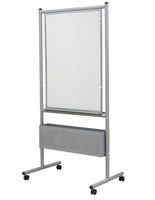 Our mobile whiteboards all feature caster wheels to roll from room to room. 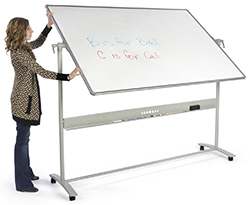 Their easy-to-move design is excellent for schools and corporate campuses where writing surfaces are needed by different people at different times. 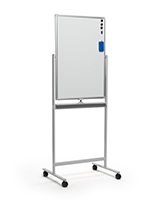 Mobile whiteboards' double sided displays facilitate brainstorming in today's collaborative learning or business environment. 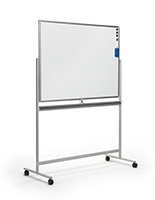 Rolling dry erase boards are ideal for sharing ideas in both commercial and educational environments. 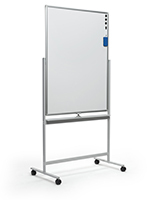 Our mobile whiteboards' magnetic surfaces add even more functionality — users can easily attach documents next to their written work. 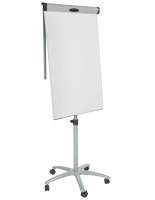 What features make these white boards with wheels special? 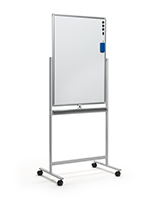 Double sided mobile whiteboards have more writing space for saving prior work and group activities. 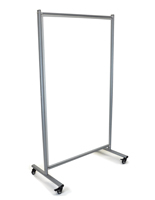 Most models have a flippable design that makes it easy to display the back. 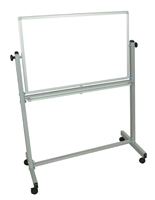 This style of the rolling write-on fixture has knobs on the sides of the frame or a lock at the bottom that that allows users to change sides. Feature a presentation then flip it to take notes or answer questions on the back. Alternatively, managers can save brainstorming sessions on the reverse side and use the front for more notes. 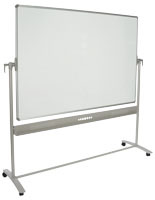 Rolling magnetic whiteboards are great for attaching papers or other documents next to written messaging. Rare earth magnets hold posters and printouts on these write-on surfaces. 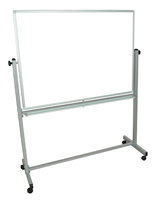 This is ideal for presenting charts and diagrams alongside written information in dry erase marker. Instructors often print out materials as teaching aids and write the rest of the lesson out in large, readable text. 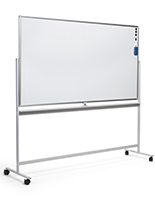 Portable write-on boards are made for mobility in large offices and schools. But what about stability? Each model has four or more caster wheels, and at least two of these have a locking design to stay still during use. 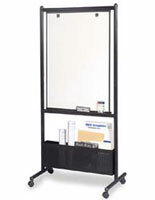 These convenient rolling markerboards can switch between moving and stable on the fly. 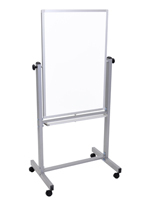 Our portable whiteboards are offered in a number of sizes to meet the needs of any classroom or conference room. 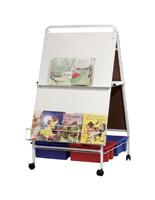 Choose writing surfaces as small as 36" x 24" and as large as 69" x 45.5" to fit in any space. 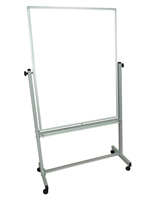 These wheeled markerboards come in both portrait and landscape orientations. 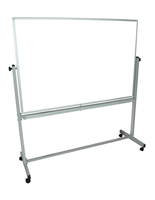 Remember that most of these teaching and presentation fixtures are double sided, so you'll get twice as much space. 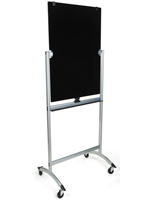 These write-on boards with wheels all feature a write-on surface for use with dry erase markers. 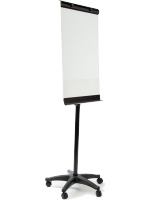 Because these displays feature a painted stainless steel surface, they should not be used with liquid ink markers. 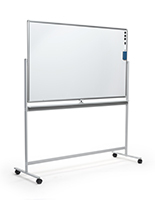 However, our modern tempered glass white boards are great for both wet and dry erase markers, allowing presenters to write and draw in multitude of colors.